Several limited-edition bronze maquettes of both 'Hamilton Warhorse' and Leaping Horse' will be available following the unveiling of a commemorative bronze war-horse statue that will stand large at Hamilton Memorial Park. Former Army artist Matt Gauldie has created this striking bronze, which will be unveiled this Armistice Day, 11 November. "Working on the Hamilton War Horse has been tremendous," said Gauldie. It has been great to see the pride and enthusiasm Hamiltonians have for their own public art and Waikato WW1 history." Noeline Jeffries, president of the War Horse Board, told guests at a special preview recently that the horse had been given the name Gunner. 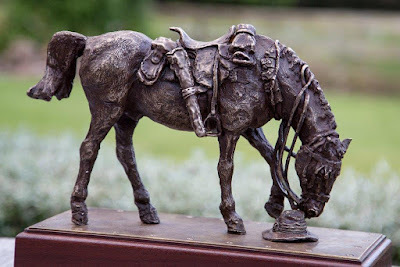 A percentage of proceeds from the maquettes will go towards fundraising for Waikato Equestrian Centre, and also towards the installation of a NZ War Horse statue at the International War Animals Memorial Garden, at Pozieres in northern France. These collectable maquettes are priced at $3500 each, including GST. Lay-buy options are also available. Gauldie has produced several prominent WW1 commemorative bronzes sited in public spaces around New Zealand. These include 'Ataturk Turkish Monument' at Pukeahu National War Memorial in Wellington. Another public bronze, this one titled 'Line of Fire' and of Gallipoli artist Sapper Moore-Jones, is located in central Hamilton. Gauldie's sculptures and paintings are in numerous public and private collections throughout the country. 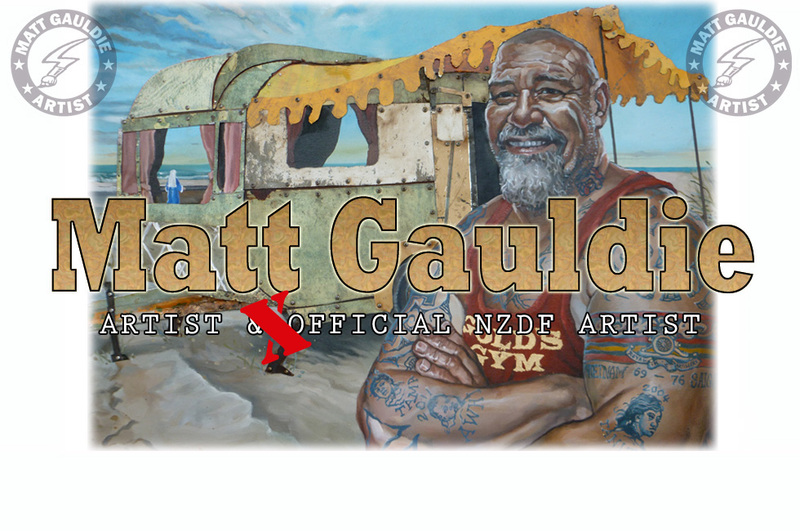 He has achieved widespread recognition both as an accomplished sculptor and a painter, portraying the past and present in big and bold works with precision in detail. "It's a tremendous honour to be able to continue to serve my country with art, whether in bronzes or on canvas," he said. "It is something I'm very proud of." Inquiries for the maquettes can be made here. A big bronze war-horse statue, set to become a national monument, has been welcomed to the Waikato prior to its official unveiling on Armistice Day, 11 November 2017. 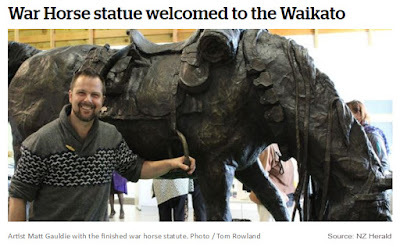 The memorial work created by Otaki artist Matt Gauldie is a tribute to the thousands of horses and troopers of the New Zealand Mounted Rifles who served in the First World War, and earlier. Noeline Jeffries, president of the War Horse Board, told guests at the special preview last week that the horse had been given the name Gunner.